The report could be about a demonstration, a group outing or dig, community support project, or special activities held during an annual show. I invite you to send me a few photos and a short description - including the names of any featured guests or organizations - of the event, as well as the name of your club and web address or social media page. Email the above information to me at editor@rockngem.com to have your club featured in Club Corner. Jack Hoque addressing the crowd as he demonstrates the techniques of intaglio carving. 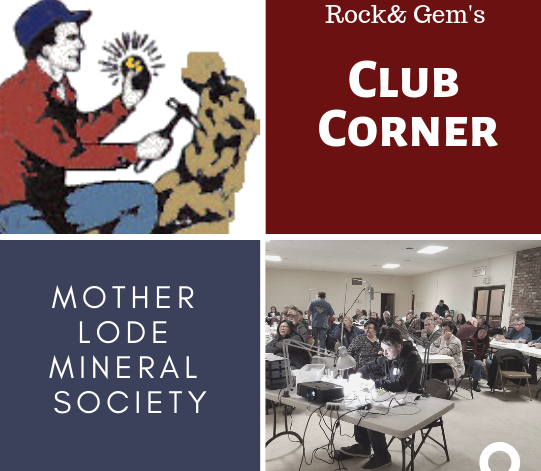 We are kicking of R&G's Club Corner with a report from the Mother Lode Mineral Society of Modesto, California. 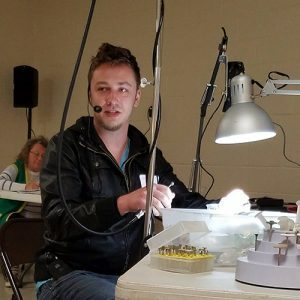 During a recent meeting, the club welcomed glyptic artist Jack Hoque from Medford, Oregon. Jack did a demonstration of his work, intaglio carving, and answered questions from the nearly 90 people in attendance. The club's new projection system made for superb viewing of Jack Hoque's intricate work. The Mother Lode Mineral Society is part of the California Federation of Mineralogical Societies (www.cfmsinc.org) and the American Federation of Mineralogical Societies (www.amfed.org).